This month we upgraded the text editor that you use to compose e-mail messages and post notes to a forum. The new editor has a backup/restore feature that lets you recover lost messages. It allows you to drag and drop images into your message. It has a full screen mode and an HTML edit mode. The Automated Electronic Newsletter now has links to upcoming events. Boy Scouts can now see who is already signed up for shifts when they go to sign up. COMING NEXT MONTH: New Boy Scout rank requirements for 2016! Scouts who have already started a rank with the old requirements will be grandfathered in. Scouts who are just beginning a rank will default to the new requirements. 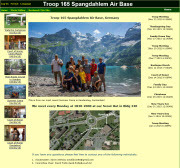 Troop 165�s homepage is a knock-out, anchored by a gorgeous shot of the troop at summer camp in the Swiss Alps. The site is elegant in its simplicity and offers tons of photos in the galleries to illustrate the many different activities of this adventurous troop. Temperatures are dropping, a sure sign winter is on its way. What is the coldest temperature ever recorded on our planet? Click here for the answer plus more interesting stuff in Katie�s Corner!